3D printer maker Stratasys today unveiled an enhanced integration with Adobe's Photoshop that allows users to design and print objects with more than 1,000 colors. Stratasys today released Creative Colors software, which is powered by the Adobe 3D Color Print Engine. The software now comes bundled with Objet 500 Connex3 printers or can be purchased for existing 3D printers. An Object 500 Connex3 printer, which costs about $250,000, can produce multiple parts at the same time using thermoplastics of varying colors and textures. "Inside Photoshop natively, we've optimized our materials to their Adobe color pallet. So now we can not just offer 46 colors..., but over 1,000 colors and all those gradients in between," said John Gould, president of Stratasys North America. "Literally, inside Photoshop there's Connex3 option, and you can print straight through to your printer," Gould added. 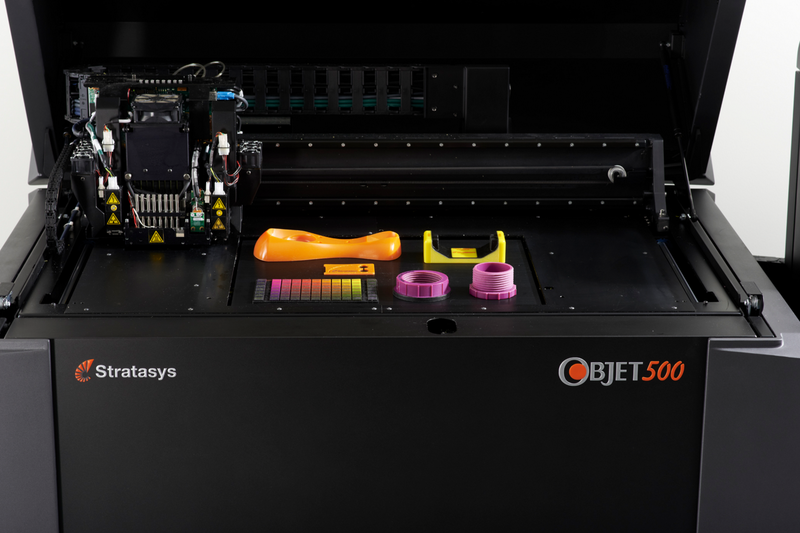 In the most basic terms, Stratasys' Creative Colors Software forms a direct bridge between Adobe Photoshop's Creative Cloud (CC) application and the Objet Connex3 3D printer. Besides printing directly to a Connex3 3D printer, Photoshop users can also choose to print objects via Stratasys' Direct Manufacturing parts-on-demand service. The cloud service then sends a user the object via next-day shipping. "The big sneaker makers, the big movie production houses, the large toy companies are going to go crazy over this because now they can literally replicate the end use look and feel on Photoshop," Gould said. A Stratasys Object 500 Connex3 3D printer. Other than the additional gradients of color, the main advantage for users of Stratasys' Connex3 commercial printer is a streamlined workflow. "Our goal is to drive simplification to the 3D print workflow. That's what the exclusive partnership with Adobe aims to do," Gould said. "It's almost a click-to-print functionality within Adobe Photoshop to choose the colors and materials you print with." In 2014, Stratasys introduced the world's first multi-color, multi-material 3D printer, the Objet 500 Connex3. That same year, Adobe announced that its cloud-based imaging and design software, Photoshop Creative Cloud (CC), could natively export files to 3D printers. Stratasys' Connex3 3D printer uses "PolyJet" 3D printing technology, which is similar to inkjet printing, but instead of jetting drops of ink onto paper it sends droplets of curable liquid photopolymer onto a build tray, layer by layer. Additionally, Gould announced two new colors on the Connex3 printer: a bold Cyan blue and a "pure" white. 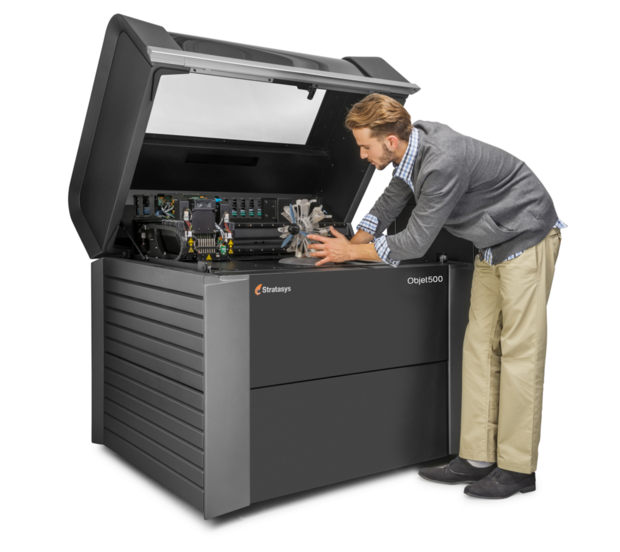 Stratasys has also ended its Connex2 and Connex1 3D printer line and will now only sell the latest Connex3 model. "We've made a conscience decision to simplify our Connex portfolio," Gould said.